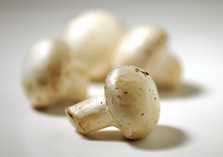 Leslie Baumann in the Herald this morning writes about the power of mushrooms. As some of my North Georgia ancestral kin might have said, "Mushrooms are good for what ails ya." In a large soup pot, heat the oil over medium heat. Sauté the onions and garlic for 1 minute, stirring frequently. Add the boiling water, tomato paste, stock powder, barley, mushrooms, carrots, celery, 2 teaspoons dill, the thyme, and salt. Stir well and bring to a boil. Cover, lower the heat, and simmer for 5 minutes. Taste and add up to 1 teaspoon more dill if you like. Cover and simmer until the vegetables and barley are tender, about 15 more minutes. If you wish, enhance the flavor with either sherry or balsamic vinegar, and add black pepper to taste. -Sass, Lorna Sass’ Short-Cut Vegetarian – Great Taste in No Time (William Morrow 1997), p. 56, with modifications by Carol Stokes.